Two sad deaths last week: First, Michael Hastings, the notably adversarial reporter who helped bring down General Stanley McChrystal, died in a car crash at the age of 33. He had been working on another national security story, and was apparently worried about an FBI probe. As one of the few journalists who didn’t kowtow to power, he was known for making enemies and for that he will be missed. James Gandolfini also passed away last week. He was 51. Gandolfini was of course most known for his role as Tony Soprano, one of the most memorable characters in television history, but he was also generous and sincere, as many remembrances have pointed out. David Chase remembers him as a genius. Mitch Hurwitz did a Reddit AMA. Edward Snowden answered reader questions about his leaks and motivations on the Guardian website. Then he got charged with espionage (you can read the actual complain here) and fled Hong Kong for Ecuador before the HKSAR could track him down. Though charging him with espionage may seem extreme, it’s part of the Obama Administration’s ongoing war on leaks and attacks on journalists. But don’t let the drama surrounding Snowden distract from the real scandal: the growing NSA surveillance state. Even noted police statist Ray Kelly is troubled by it. Here are some ways to defend yourself. Also, Paul Shirley on why you shouldn’t trust the government. Why can’t American DVRs be more like Eurpoe’s? This week in oral histories: Brian Windhorst on the 2003 NBA Draft, 10 years later. Brian Raftery on his new book about the Upright Citizens Brigade. NPI’s thoughts go out to Brandon McCarthy, a good pitcher and a great Tweeter, who got hit with a line drive. He’s still in serious condition, but keeps making us laugh. The Atlantic breaks down where Bill Clinton improvised in his DNC speech. Vikings punter Chris Kluwe offers an amazing response to a Maryland state senator’s idiotic letter opposing an NFLer’s support of gay marriage. Mitch Hurwitz talks about bringing back Arrested Development. The Awl tries to solve a murder. D.T. Max’s biography of David Foster Wallace came out last month (read an excerpt). Max has been discussing certain documents he reviewed in the course of writing, including DFW’s childhood writing and his first pitch letter. Meanwhile, at least one prominent author hates Wallace, and someone who edited both of them says he knows why. Vince Gilligan discusses the finale of Breaking Bad. Someone on the Internet estimates how much cash Walter White actually had. Speaking of the drug war, here’s an excellent piece on the use/abuse of confidential informants by the police. Ten heartbreaking moments from The Simpsons. Art Modell died. Joe Posnanski, a native of Cleveland, offered his thoughts, which were more generous than some other Clevelanders. Posnanski also weighed in on the Strasburg decision. Two stunning technological developments this week: one involves Google (in the transportation industry!) and and another does not involve Google (but involves rat brain cells). John S wasn’t the only one to criticize Malcolm Gladwell’s analysis of social media’s relationship to activism. Maria Popova had a well-written retort, and Angus Johnston had a reply at The Huffington Post. Gladwell, for his part, responded by belittling Twitter again and calling Johnston a narcissist. Tim mentioned Gladwell’s session with Bill Simmons at The New Yorker Festival in Unabated to the Quarterback, but here’s the Deadspin rundown in case you missed it (amidst the Duke Thesis and Brett Favre, umm, pictures). Mitch Hurwitz, the genius behind Arrested Development, gave two interviews last week about trying to make his new series, Running Wilde, more viewer-friendly than Arrested Development was. The interviews may sound troubling, but NPI is enjoying the new series enough to offer an endorsement. In the wake of The Social Network, which John S reviewed yesterday, Mark Zuckerberg made a historic donation to Newark public schools. Some people had questions about the donation’s timing, but Jose Antonio Vargas tried to get at the root of Zuckerberg’s idiosyncrasies. Meanwhile, New York did a feature on Aaron Sorkin and the making of the film.The New Republic‘s Lawrence Lessig liked the film, but said it fell short of what it could have been. We doubt we could construct a better theoretical piece of sports journalism than Joe Posnanski on Vin Scully. It works practically, as well. To appease Tim’s burgeoning Auburn fandom (WAR EAGLE!) on a week where Alabama lost, here’s a multi-angle view at QB Cam Newton’s remarkable throw on Saturday night (Tim: “College football play of the century, obvs”) and an in-depth look at one of the University’s most well-known recent grads. You may not know who Alice Fraasa is, but we bet you’ve seen her. Both, by the way, are courtesy of the excellent War Eagle Reader (for all the other, NPI/Auburn fans). Is this a libertarian failure or success? 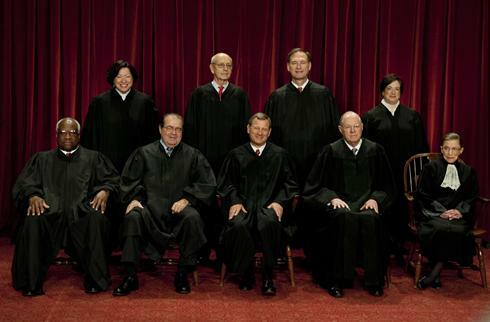 The new Supreme Court class photo is out: Scalia’s looking old and Ginsburg’s looking, umm, uncomfortable? Two games that are, indeed, all about corners — Monopoly and The Wire — together at last. It seems fair to call Courrier International‘s “Learn to anticipate” ads in, well, poor taste. We were going to read this article on procrastination, but we never got around to it…. With news that Fox is close to greenlighting a pilot that would team Will Arnett up with former Arrested Development co-creator and executive producer Mitch Hurwitz (as well as AD co-executive producer Jim Vallely, who wrote the scripts for some great episodes, including “Pier Pressure,” “Righteous Brothers,” and “S.O.B.s”), the big (and sometimes insularly arrogant) Arrested Development fans here at NPI couldn’t help but get a bit excited. 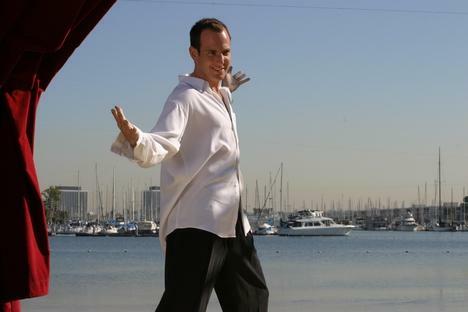 After all, the news that Arnett will be playing “a rich Beverly Hills jackass” sounds more than a little Gob Bluth-esque.